MySQL to Oracle Database Converter Software provides complete solution to convert MySQL database into Oracle database records. Database Conversion program supports entire database key constraints and attributes. MySQL to Oracle Database Converter program maintains database integrity and entire MySQL database records are maintained in their original format. Now without using database programming, you can easily migrate MySQL records into Oracle database records with MySQL to Oracle Database Converter software. 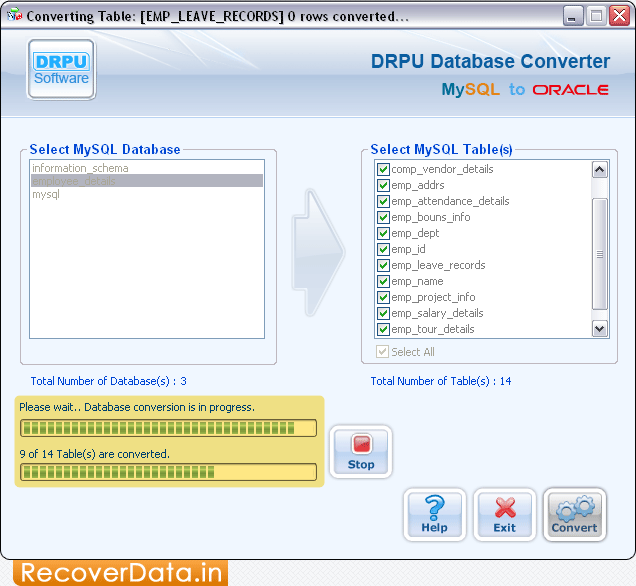 Converts entire or selected MySQL database into Oracle database. Supports key constraints, data types and attributes of MySQL during database conversion. Save converted Oracle database records at user specified location on the system. Supports all major versions of MySQL and Oracle database.